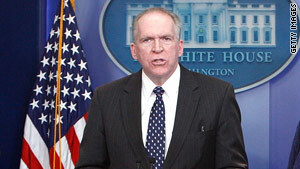 Deputy National Security Adviser John Brennan briefed reporters Thursday on the terror report. Report finds the intelligence community failed to "connect the dots"
Washington (CNN) -- The government had sufficient information to have potentially disrupted an al Qaeda plot to bomb an airliner on Christmas Day, but failed to identify Umar Farouk AbdulMutallab as a potential bomber, a White House review of the incident shows. In the end, the six-page report found, it was the inability of the intelligence community to "connect the dots" in putting all the pieces of information and analysis together. "The intelligence fell through the cracks. This happened in more than one organization," Deputy National Security Adviser John Brennan told reporters after President Obama spoke Thursday. Information was gathered on a possible al Qaeda plot , according to the report, between mid-October and late December 2009. "Though all of the information was available to all-source analysts at the CIA and the NCTC [National Counter Terrorism Center] prior to the attempted attack, the dots were never connected, and as a result, the problem appears to be more a component failure to 'connect the dots,' rather than a lack of information sharing," the report said. Al Qaeda in the Arabian Peninsula, a Yemen-based offshoot of the terrorist network that attacked New York and Washington in 2001, has claimed responsibility for the December 25 plot. According to the report, U.S. counterterrorism officials had information about AbdulMutallab, al Qaeda threats to Americans "and information about an individual now believed to be Mr. AbdulMutallab and his association with AQAP and its attack planning." But "the dots were never connected" -- not because information wasn't shared among U.S. agencies, but because it was "fragmentary and embedded in a large volume of other data." Once the threat was discovered, the intelligence community leadership failed to increase resources working on the "full AQAP threat." The report also found there was no mechanism in place to follow leads to their conclusion and to identify this gap ahead of time. "The overlapping layers of protection within the [counterterrorism] community failed to track this threat in a manner sufficient to ensure all leads were followed and acted upon to conclusion." There were also a series of human errors which "delayed dissemination of a finished intelligence report and what appears to be incomplete/faulty database searches on Mr. Abdulmutallab's name and identifying information." Released along with the report was a three-page order from Obama outlining what various agencies need to do to correct the "inherent systemic weaknesses and human errors" the review found. The departments of State and Homeland Security, the FBI, CIA, National Security Agency, National Counterterrorism Center and the office of the director of national intelligence, as well as the White House national security staff, have been ordered to report back within 30 days. The report found that the watch-list system is not broken, but "needs to be strengthened and improved." In addition, a reorganization of the intelligence or "broader counterterrorism community is not required to address problems that surfaced in the review, a fact made clear by countless other successful efforts to the thwart ongoing plots." The report added that the counterterrorism community failed, "starting with establishing rules and protocols, to assign responsibility and accountability for follow up of high priority threat streams, run down all leads, and track them through to completion."